Today, the North Korean markets seem to have returned to the days before the currency redenomination. 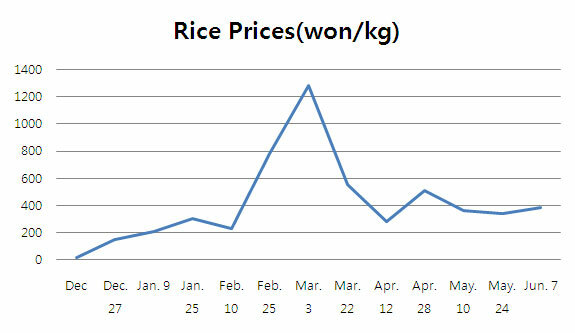 The price of rice appears to be rather stable, especially when compared with that of February or March. Especially, following Kim Jong Il’s trip to China, rumors indicating that food would be imported began to circulate, and this has made declining prices even more marked. According to inside sources, the price of rice in Hoiryeong, North Hamkyung Province is now 480 won per kilo (June 4th), 420 won in Sinuiju (June 7th), 360 won in Sunam-district of Pyongyang (June 2nd), and 380 won in Sariwon (June 7th). The price of corn is approximately 50% that of rice, although recently in Hwanghae Province, households using corn as feed for pigs drove an unusual situation where the corn price reached almost 70% that of rice. The exact nature of Chinese support for North Korea cannot be confirmed officially, however, the North Korean regime’s encouraging foreign currency earning enterprises to import food from China since March seems to have contributed to rice price stabilization. One inside source added that the “reactivation of food smuggling on the border between North Korea and China” has also helped. However, the main overall reason for the failure of the initial prediction, “When the farm hardship period comes in May and June, food prices will skyrocket” appears to have been the normalization of the market. The source explained, “Markets everywhere now open between 2 and 4 P.M. and close at sunset,” adding that there are small differences depending on the particular market. In North Hamkyung Province, the market normally closes at sunset; however, markets in Hwanghae Province and Pyongan Province, which are under heavier pressure due to the rice planting, close earlier, at around 6 P.M. But concerns about food will not be solved even if the price of rice remains stable. Merchants are still watching prices with a concerned look since rumors constantly assert that food prices will increase again in July. The North Hamkyung Provincial Party Committee held a cadres meeting last May in which it released news that food distribution for the months from July to October must be prepared by each unit individually, meaning that the central authorities have no plans to assist. The agricultural situation is one concern. North Korea has been suffering from a severe fertilizer crisis since the beginning of spring farm preparations. After Kim Jong Il’s visit to China, Chinese fertilizer was imported which temporarily alleviated the situation, but the rumor is that fertilizer for the summer has yet to arrive. Recently, Kim Jong Il visited a domestic fertilizer production facility, Namheung Youth Chemical Works in Anju City, South Pyongan Province. There, he complimented factory management, saying, “It is a relief to know that fertilizer is being produced in Namheung.” The incident displays North Korea’s concerns about fertilizer. Other factors which destabilize food prices are the icy inter-Korean relationship and international community sanctions. Sharply decreasing trade in higher priced goods like home appliances and furniture is derived from the same source. The tumbling credibility of the North Korean currency is another ongoing worry, as is a lack of small denomination bills. One source explained, “If you purchase a 30,000 won jumper from Sungyo Market in Pyongyang, the cost is $30 (market exchange rate, the equivalent of 27,000 won on the day), but it is 30,000 won if you pay in North Korean currency.” That’s a ten percent mark-up for people using local currency, the material representation of a lack of trust in the won. In areas of Pyongyang, Wonsan, Sariwon, and Haeju, dollars and then Euros are preferred over won, but in Jagang Province, Yangkang Province, and North Hamkyung Province, Yuan are preferable to dollars. Places where all four; U.S. dollars, Yuan, Euros and won are being used are Sinujiu and the port city of Nampo on the west coast. One source explained that due to this situation, high-priced products like televisions, DVD players and refrigerators are being sold only for U.S. dollars or Yuan. At the time of the currency redenomination, North Korea displayed 7 kinds of small bills and coins; 1 chon, 5 chon, 10 chon, 50 chon, 1 won, 5 won, and 10 won. The source explained that demand for the ‘chon’ unit coins is practically non-existent; the problem is that 1 won, 5 won, and 10 won are frequently used in market trading but a shortage of bills is causing inconvenience. Merchants are setting the price of goods mostly in increments of 10 won and 50 won as a result. Everything Is Stable, But for How Long? This entry was posted on Thursday, June 10th, 2010 at 10:48 am and is filed under Agriculture, Banking, Clothing, Finance, Finance and Accounting Department, Fiscal & monetary policy, Food, General markets (FMR: Farmers Market), Price liberalization. You can follow any responses to this entry through the RSS 2.0 feed. Both comments and pings are currently closed.